Birth Allowed Radio is Birth Monopoly’s latest project and foray into into creating media that influences culture. We’ll cover the ways in which women and families are “allowed” and “not allowed” to give birth on their own terms, often via story-telling. 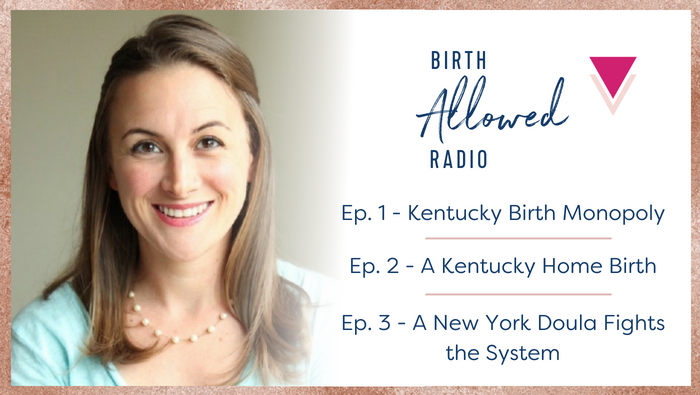 Here are our three debut episodes, where Cristen discusses with various guests topics like the Kentucky birth monopoly, home birth, obstetric violence, bans on vaginal birth after Cesarean (VBAC), and being a doula in an abusive system. The radio show broadcasts every other Sunday on WLXU Lexington [KY] Community Radio, and each episode will be available to you right here on Birth Monopoly as a podcast. [49 minutes] In this episode, Cristen talks with Mary Carol Akers, a certified nurse midwife who has been fighting local hospitals for years to open an independent birth center in Kentucky; Mary Kathryn Delodder, the head of the consumer coalition working to legalize out-of-hospital midwifery in Kentucky; and a Central Kentucky couple who was turned away from two hospitals *while the mother was in labor* for wanting to have a vaginal birth after Cesarean. [55 minutes] In this episode, Lexington, KY, couple Helen & Kris Nonn describe the home birth of their son, born “illegally” with Certified Professional Midwives, and talk about why they made that choice for his birth. [53 minutes] In this episode, a doula based out of New York City talks about the abuse she experiences and witnesses as she supports clients during childbirth.